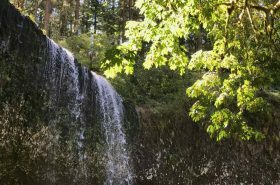 When it gets too hot in Portland and you want to get away, what you need is a hike with lots of shade, lots of water, and not too much hassle. 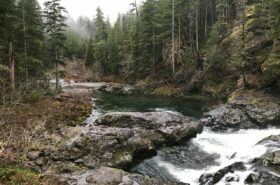 Consider the Roaring River Wilderness, up the Clackamas River. This is a 90-minute drive to a pleasant, up-and-down loop with six lakes, a flower-filled meadow, late-summer huckleberries, views of five Cascades volcanoes, and a beautiful forest. This quiet, woodsy hike in the Roaring River Wilderness used to be known simply as the Rock Lakes Loop, or maybe the Serene Lake Loop. 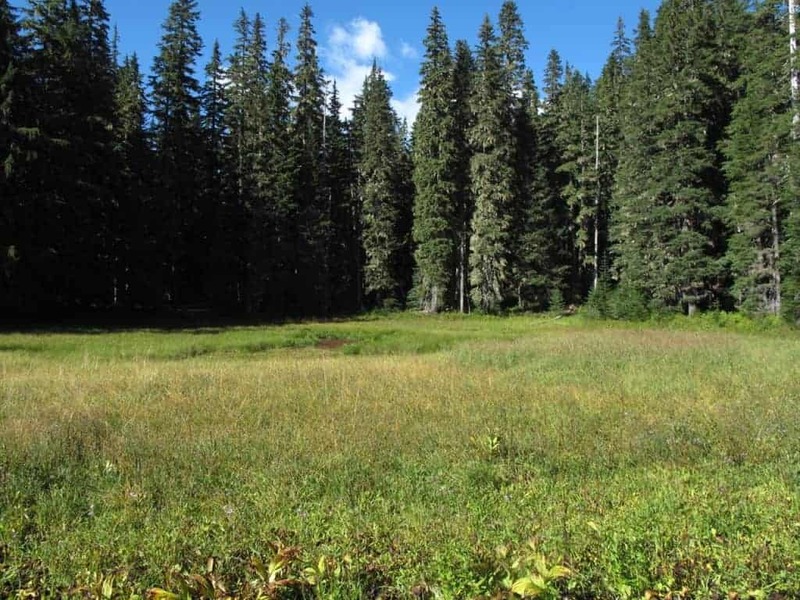 But in 2009 the whole place became a new wilderness area. And yes, it’s a long-ish drive and hike. But there are shorter, lovely options. And if you want to do the whole thing, consider it as a backpack. Or you can car-camp at Hideaway Lake, very near the trailhead. If you’re hiking with a dog, it will love all the water to splash in. Kids will love hitting a big, beautiful lake in less than a mile. 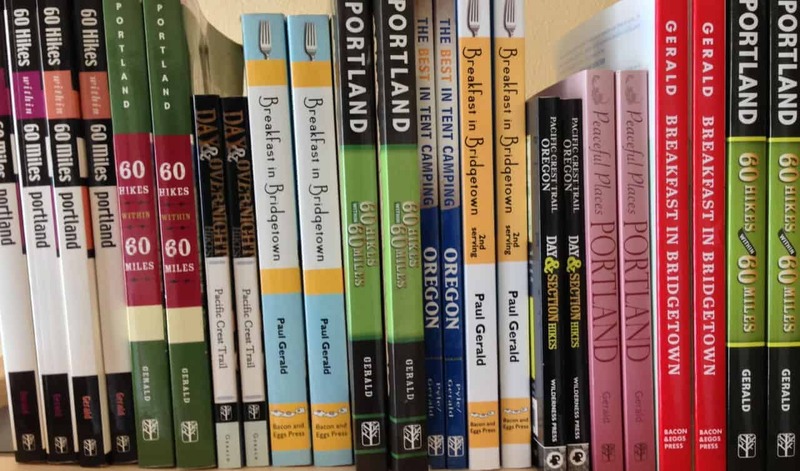 This hike, and 59 others, is covered in detail in my book, 60 Hikes Within 60 Miles of Portland. Shellrock Lake is just half a mile from the trailhead. 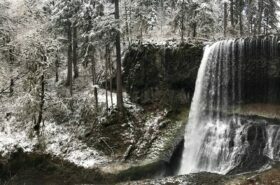 Take OR 224 from Portland, traveling 44 miles southeast of I-205, through the town of Estacada, to the Ranger Station at Ripplebrook. Half a mile past the Ranger Station, turn left onto FS 57. Drive 7.6 miles on FS 57, and turn left onto FS 58. Go 3 miles and turn left onto FS 5830 and follow it 5.7 miles, staying left at one un-signed junction, to the Shellrock Lake Trailhead, on the right just past Hideaway Lake Campground. At the Shellrock Lake trailhead, you may at first wonder why you’re here. 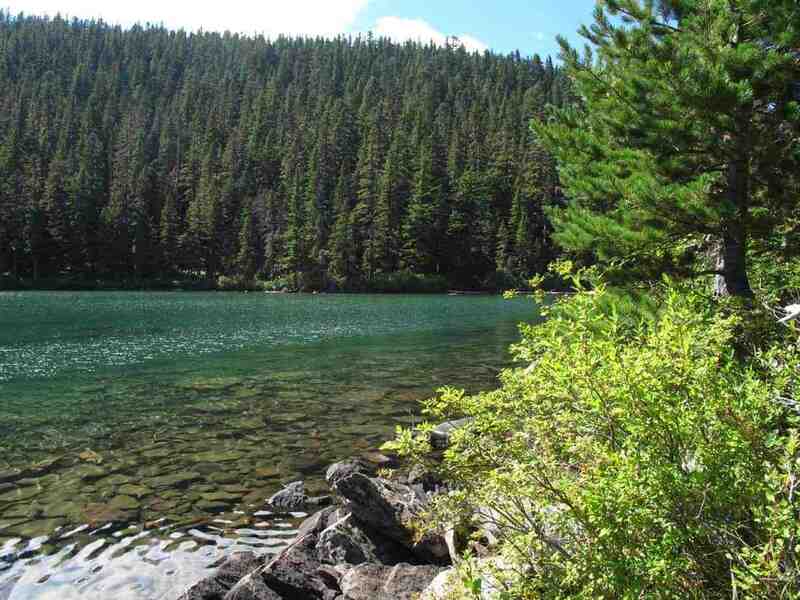 But the clearcut is only half a mile long, after which you arrive at big, beautiful Shellrock Lake, with campsites galore and stocked trout—a great destination for kids. To keep going, circle the lake on the right side and follow the trail a mile up the hill, following a sign for Frazier Turnaround. Turn right on Trail 517, and in a moment you’ll arrive at Frazier, an old trailhead served by a horrible road. Did you know I lead hiking tours in Europe? and a tour of Tuscany like this one from 2015. Look for Serene Lake Trail (512) going downhill and to the left, and follow it 0.8 miles down to a junction. The loop keeps going here, but you should definitely go left a nearly flat quarter mile to Middle Rock Lake, with a few nice campsites and a mildly sketchy, roofless outhouse. Turn right when you get to the lake, cross the outlet creek, walk to the far end of the lake, then follow a short trail up the hill to Upper Rock Lake, the smallest of the three—and host to a single, private, dreamy campsite. The loop to Middle and Upper Rock Lakes adds just over 1 mile to your day. From the main trail (if you did not turn left for Middle Rock Lake), follow go another couple hundred yards and you’ll come to a trail leading right, to Lower Rock Lake, which has one inferior campsite. If you’ve got small kids, or you feel done for the day, you are now 3 miles from your car. But for an even nicer lake, and then some, keep going. You’ll put in another mile going downhill, then turn up (steeply at times) for most of a mile to top a ridge and, 4.3 miles from the trailhead, come to gorgeous Serene Lake. 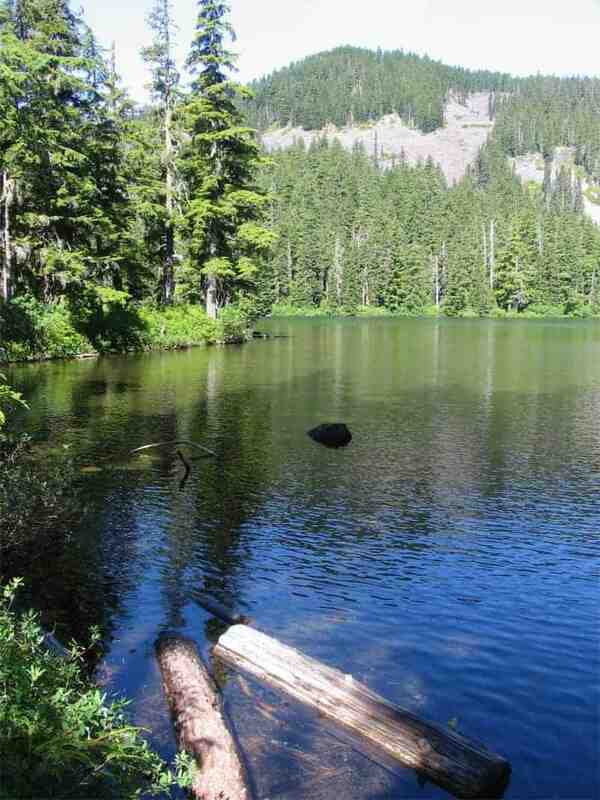 Look for campsites around the lake; the best is at the far end, beyond a big boulder excellent for jumping in. The trail continues around the right side, and you turn at a junction with a table and (until recently) an Adirondack chair! There used to be furniture at this campsite! 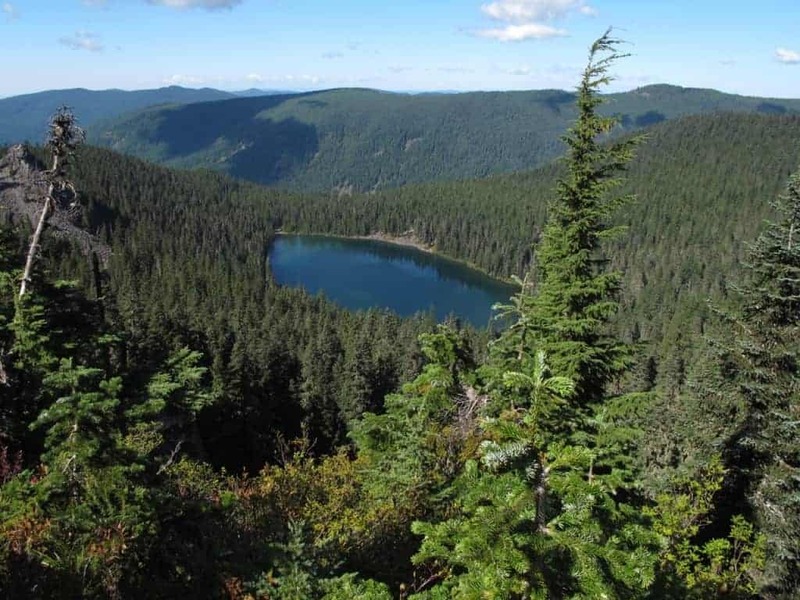 Beyond Serene Lake, the trail climbs about 600 feet in less than a mile to the top of a ridge and a junction with Grouse Point Trail (517). Turn left here, climb 200 more feet, and in 0.7 miles you’ll pass a sublime view back down to Serene Lake, and out to Mounts St. Helens, Rainier, Adams, and Hood. The trail now drops 700 feet in a mile, and when you get to the flower-filled Cache Meadow, you’ll find the lily-filled Cache Lake to the left. To continue the loop, turn left and go 200 yards to the site of an old shelter. A minute past that, turn left to stay on Trail 517 and take it uphill 1 mile (you’ll get all of that 700 feet back!) until you come to an abandoned road. Turn right, and in just under a mile you’ll be back at the trail leading down to Shellrock Lake and your car. 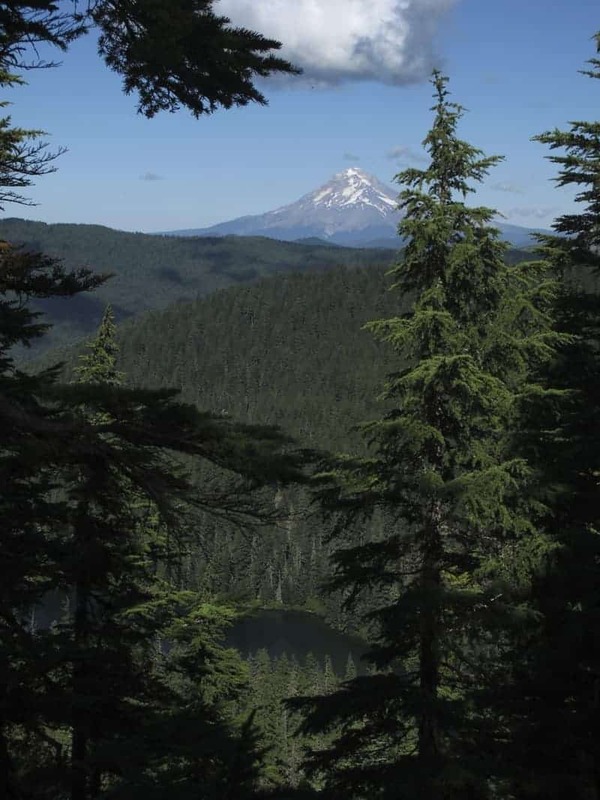 Just keep an eye out, in the clear areas along the road, for a view back to Mount Jefferson. 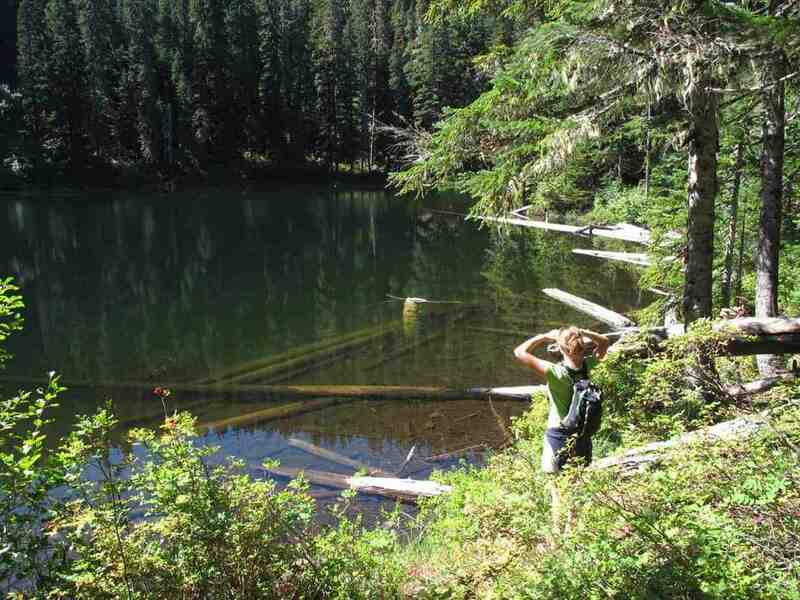 That makes this a six-lake, five-volcano hike! I give talks, sell books, and lead hiking trips to Europe! Check out the details here. I’m also nuts about English soccer. Summer Book Sale: Everything for $12! I want to do it! Aaron O’Neal what do you think? 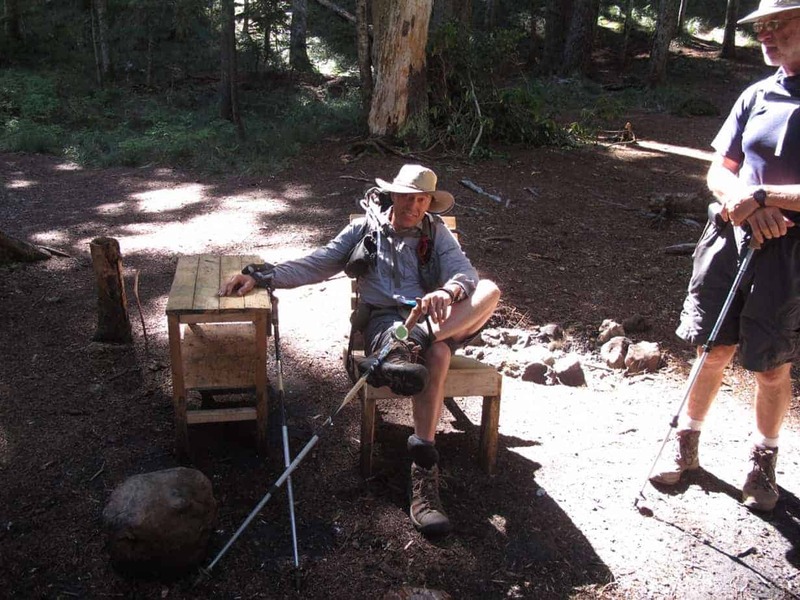 Plan to spend a night, either near the trailhead or on the trail!